I recently changed from Apple to Android (Samsung) but my payments are still on my Apple Account (which has now been closed.) How do I update my account / payment information to my Android Account? I can't seem to find an option under my Account Settings to update or change my payment information? Here's a link to cancel it with Apple. I tried to cancel my subscription so that I can reload it onto my new Android account, but when I try to cancel my subscription (Give a reason and press continue) nothing happens. It just stays at the "Continue with the Cancellation" screen. It does not want to continue from the cancellation reason screen. Thank you. I sent the message to the support team. 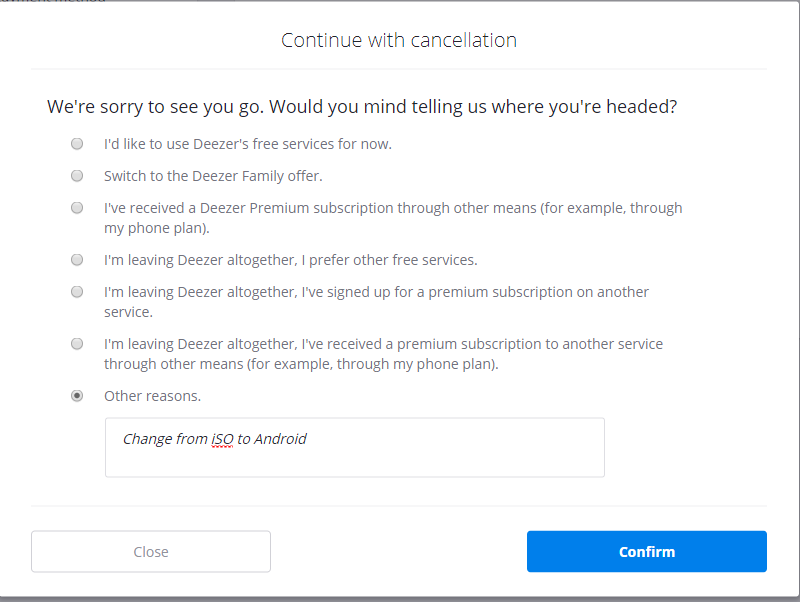 Hopefully this can get resolved as I LOVE my Deezer and would like to continue my Account.